The soup itself was a simple purée of rutabaga, green apple, onion, celery, garlic and vegetable stock...a mild foil to the garnishes, which included bits of DUCK CONFIT (!) and caramelized apples, chives and mustard cream. Using duck confit as a garnish was an inspired idea. 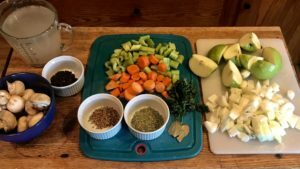 Liv's has a thing about using crazy good garnishes to bring to life soups made with winter vegetables. 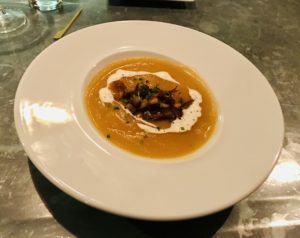 See Curried Cauliflower Soup and Celery Root Soup with Fried Capers and Crème Fraiche. So when I saw this new soup on their menu, I had to try it. And when I experienced its awesomeness, I knew I had to try to reprise it. 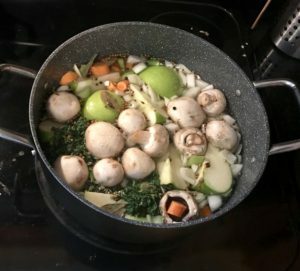 These include (l-r): 1/2 lb mushrooms, 4 packages gelatin dissolved for 10 min in 1 qt water, 2 T black peppercorn; 1 T coriander seeds, 1 T fennel seeds, 3 stalks chopped celery, 3 peeled and chopped carrots, 3 sprigs parsley, 2 bay leaves, 2 quartered Granny Smith apples, and 1 chopped onion. Also 1 chopped leek if you have one. I didn't. 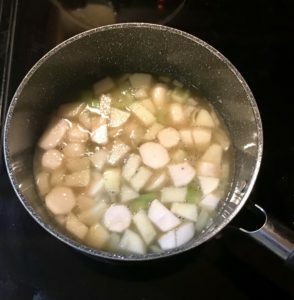 You put the ingredients in a large pot, cover with water and then with the gelatin water, bring to boil and simmer for 1 hour. You then strain the broth in a strainer lined with cheesecloth and discard the solids. Return the broth to the pot and simmer uncovered until reduced to 2 quarts. This will produce more vegetable stock than you need for the soup. The rest can be frozen and used for another soup. 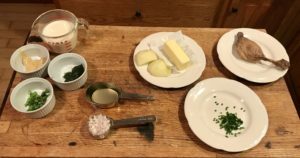 The ingredients include (l-r): 1 cup heavy cream, 2 T mustard, 1 T dill, 1 T basil, 1/2 cup dry white wine and 1/4 cup chopped shallots for the mustard cream; apple and butter for the caramelized apple (I also used a little sugar),; snipped chives; and duck confit. Here is the stovetop with the garnishes in process. I reduced the white wine and shallots till dry, then added the cream, cooked for 2 min then added the mustard, dill and basil, and cooked for another 2 min to combine the flavors. 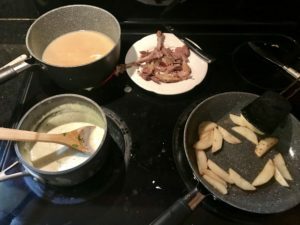 I heated up the precooked duck confit in a little butter, then pulled off pieces. 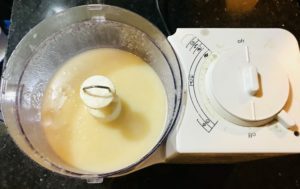 Cooked slices of apple with some more butter in the same pot, adding a little sugar. Cooked over heat high enough to brown but not burn them, then chopped them into small pieces. 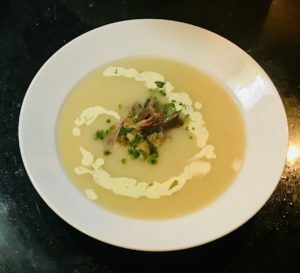 Ladled some of the soup into a bowl, swirled some of the mustard cream on top, then stacked some bits of duck confit, caramelized apple and chives in the middle. Yum!